The Doge of Venice, sometimes translated as Duke, was the chief magistrate and leader of the Republic of Venice between 726 and 1797. Pietro I Candiano was briefly the sixteenth Doge of Venice in 887. Leonardo Loredan of the Loredan family was the 75th doge of the Venetian Republic from 1501 until his death. His dogeship was one of the most important in the history of Venice. The Republic of Ragusa was an aristocratic maritime republic centered on the city of Dubrovnik in Dalmatia that carried that name from 1358 until 1808. It reached its commercial peak in the 15th and the 16th centuries, before being conquered by Napoleon's French Empire and formally annexed by the Napoleonic Kingdom of Italy in 1808. 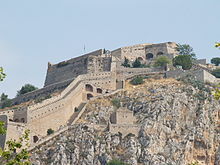 It had a population of about 30,000 people, out of whom 5,000 lived within the city walls. Its Latin motto was "Non bene pro toto libertas venditur auro", which means "Liberty is not well sold for all the gold". The maritime republics of the Mediterranean Basin were thalassocratic city-states which flourished in Italy and Dalmatia during the Middle Ages. The best known among the maritime republics are Venice, Genoa, Pisa, and Amalfi. 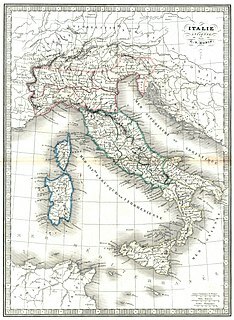 Less known are Ragusa, Gaeta, Ancona, and Noli. Domenico Selvo was the 31st Doge of Venice, serving from 1071 to 1084. During his reign as Doge, his domestic policies, the alliances that he forged, and the battles that the Venetian military won and lost laid the foundations for much of the subsequent foreign and domestic policy of the Republic of Venice. He avoided confrontations with the Byzantine Empire, the Holy Roman Empire, and the Roman Catholic Church at a time in European history when conflict threatened to upset the balance of power. At the same time, he forged new agreements with the major nations that would set up a long period of prosperity for the Republic of Venice. Through his military alliance with the Byzantine Empire, Emperor Alexios I Komnenos awarded Venice economic favors with the declaration of a Golden Bull that would allow for the development of the republic's international trade over the next few centuries. The Second Ottoman–Venetian War was fought between the Ottoman Empire and the Republic of Venice for control of the lands that were contested between the two parties in the Aegean Sea, Ionian Sea and the Adriatic Sea. The war lasted from 1499 to 1503. The siege of Thessalonica between 1422 and 1430 saw the Ottoman Empire under Sultan Murad II capture the city of Thessalonica. Thessalonica remained in Ottoman hands for the next five centuries, until it became part of the Kingdom of Greece in 1912. Domenico Morosini was the thirty-seventh doge of the Republic of Venice, reigning from 1148 until his death in 1156. 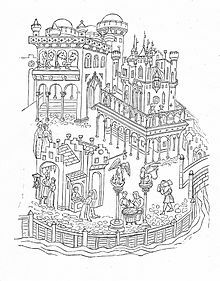 The Byzantine Empire or Byzantium is the term conventionally used since the 19th century to describe the ethnic and Greek-speaking Roman Empire of the Middle Ages, centered on its capital of Constantinople. As the direct continuation of the Roman Empire, Byzantium survived the fall of the Western Roman Empire during Late Antiquity, and continued to function until its conquest by the Ottoman Empire in 1453. During this time, many different imperial dynasties ruled over the empire; in the context of Byzantine history, the period c.1185 – c.1204 AD was under the Angeloi dynasty. 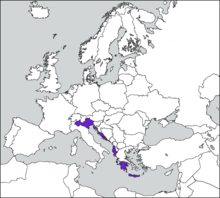 The Stato da Màr or Domini da Mar was the name given to the Republic of Venice's maritime and overseas possessions, including Istria, Dalmatia, Albania, Negroponte, the Morea, the Aegean islands of the Duchy of the Archipelago, and the islands of Crete and Cyprus. It was one of the three subdivisions of the Republic of Venice's possessions, the other two being the Dogado, i.e. Venice proper, and the Domini di Terraferma in northern Italy. The Croatian–Venetian wars were a series of periodical, punctuated medieval conflicts and naval campaigns waged for control of the northeastern coast of the Adriatic Sea between the City-state of Venice and the Principality of Croatia, at times allied with neighbouring territories – the Principality of the Narentines and Zahumlje in the south and Istrian peninsula in the north. First struggles occurred at the very beginning of the existence of two conflict parties, they intensified in the 9th century, lessened during the 10th century, but intensified again since the beginning of the 11th century. The Fall of the Republic of Venice was a series of events in 1797 that led to the dissolution and dismemberment of the Republic of Venice at the hands of Napoleon Bonaparte and Habsburg Austria. 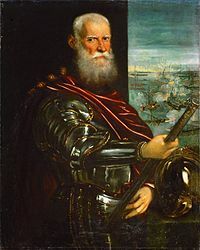 Vettore Cappello was a merchant, statesman and military commander of the Republic of Venice. After an early career as a merchant that gained him substantial wealth, he began his political career in 1439. His ascent to higher offices was rapid. He is chiefly remembered for his advocacy of a decisive policy against the Ottoman Empire, and his command of Venetian forces as Captain General of the Sea during the lead-up to and the first stages of the First Ottoman–Venetian War.